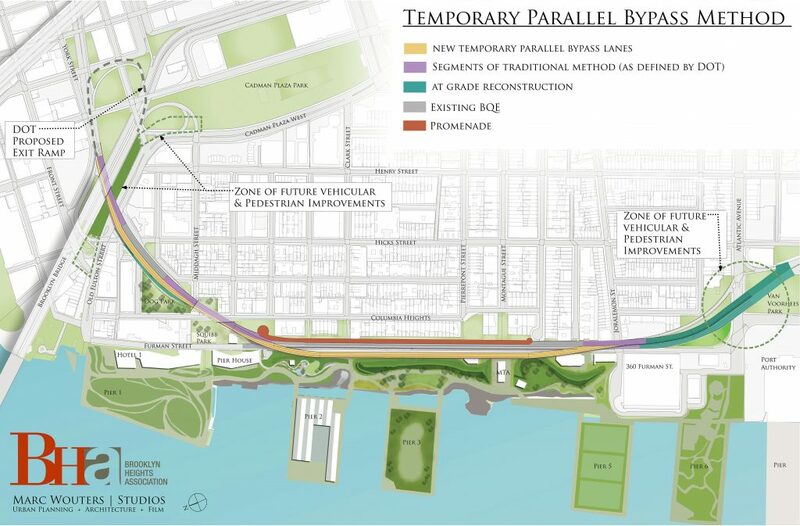 On September 27, 2018, the Department of Transportation presented to the public two options for the reconstruction of the BQE between Atlantic Avenue and Sands Street. Although we acknowledge this work is necessary and urgent, the Brooklyn Heights Association considers both DOT approaches to be unacceptable. We believe that simply opposing a bad idea is not enough when the threat is this serious, so the BHA developed with Marc Wouters Studios an alternate option which we presented to DOT in November 2018. While our engineering consultant appraised our proposal and found it to be a viable concept, it is only one possible alternate solution. Our goal is to challenge the DOT to develop a better solution than its six lane Promenade Highway. Our proposal is for a temporary solution for reconstructing the BQE in its current location, like the DOT’s two plans, but we also support developing broader urban planning ideas such as the BQP proposal by the Bjarke Ingels Group (BIG), developed in parallel to Heights resident Mark Baker’s TriLine. Click here to download a PDF version of the BHA Alternative Concept. In addition to developing this concept for the reconstruction of the BQE between Atlantic Avenue and Sands Street, the BHA strongly advocates for measures to reduce traffic volume. The Federal, State and City Governments will have to work together to approve any of these traffic management approaches, and the BHA will continue to urge our representatives to enact such measures, which include congestion pricing, reinstituting two-way tolling on the Verrazzano Bridge, and developing a long-term regional plan to permanently reduce traffic on this segment and in the city. The Temporary Parallel Bypass Method developed by Marc Wouters Studios in conjunction with the BHA is a hybrid construction concept. It combines bypass structures, traditional lane-by-lane replacement, and at-grade reconstruction for maximum efficiency. 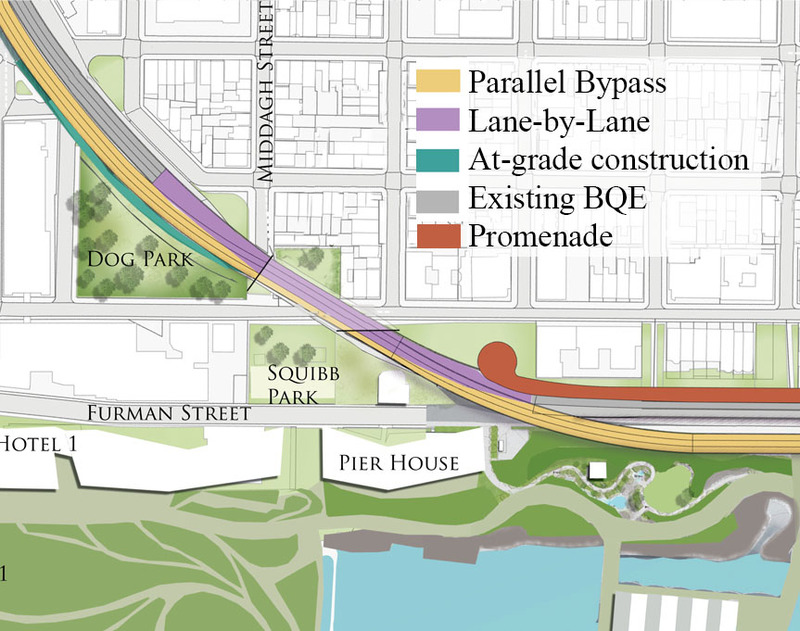 Two-tiered bypass would be built parallel to the existing BQE at the same level as the current lanes of the triple cantilever. A second parallel highway would be built between the Columbia Heights overpass and the Brooklyn Bridge. Both parallel structures would allow traffic to be diverted off the BQE for easier reconstruction of those existing BQE segments. The Park berms would need to be modified slightly to accommodate the temporary bypass highway, but the active recreational area of the park would not be affected. The bypass highway is farther from the neighborhood and below the Promenade, vastly reducing the impact of traffic and construction. The environmental and economic consequences of over 150,000 daily vehicles at neighborhood street level mere feet from homes will devastate the community. Unobstructed access to construction zone speeds up work and enables use of prefabricated components for superior design, expedited completion, and lower cost. Access to triple cantilever is impeded by columns for the elevated Promenade Highway. Work can be phased. Segments of the highway can be engineered and completed independently. Closure of the world-renowned Brooklyn Heights Promenade is minimized. All work between Atlantic and Sands must be completed before the Elevated Promenade Highway can be dismantled and the Promenade restored. The active areas of the park are protected thanks to the modified berms and sound barriers. 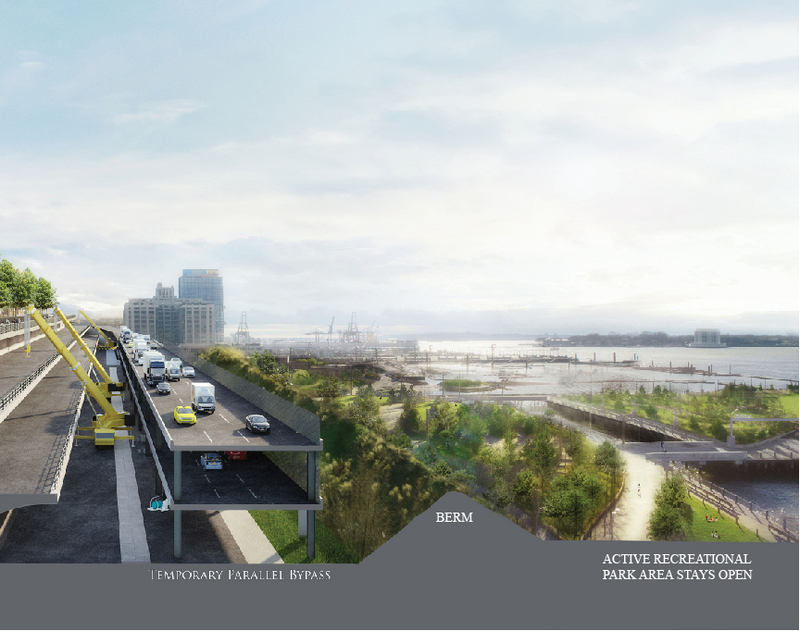 Elevated Promenade Highway renders the berms ineffective in protecting the Park from noise and pollution. Connections between the Temporary Bypass and the existing BQE are accomplished using traditional lane-by-lane method over a limited distance. The BHA’s Bypass avoids the impact of a six lane highway in this narrow corridor. 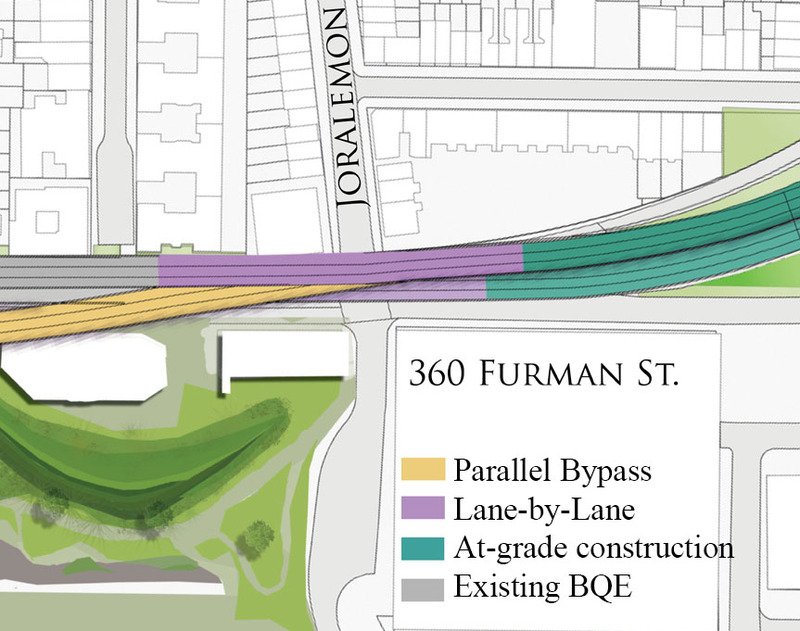 A permanent, safe pedestrian underpass at Joralemon Street can be built. Brooklyn Bridge Park access is improved. Active Park area west of berms is untouched and remains open to the public. Modified berms and sound barriers shield the Park from bypass highway and construction on the BQE. 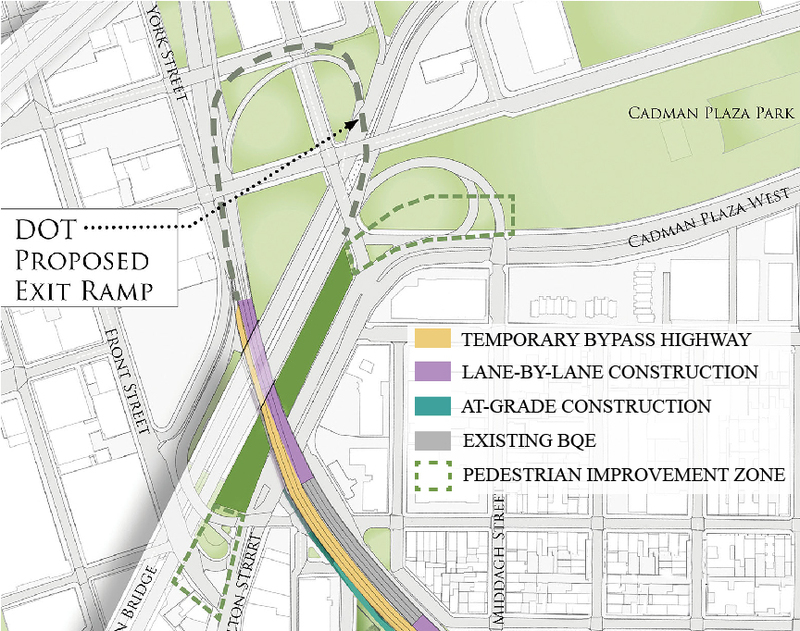 A second Temporary Parallel Bypass is constructed between Columbia Heights underpass and the Brooklyn Bridge to divert traffic from the existing BQE while repairs are undertaken. The connections and repair work at the Columbia Heights underpass are done using the traditional lane-by-lane method. This avoids the harmful flyover at Harry Chapin Playground. Connections from the Brooklyn Bridge to the BQE can be designed and completed on a schedule independent of the reconstruction of the Triple Cantilever and the Promenade. The BQE southbound entrance ramp from Old Fulton Street can be closed to reduce traffic and improve pedestrian access to the Park. Click here to download a PDF presentation of the BHA’s Alternative Concept.